Colin Kaepernick, an unsigned free agent after he voided his contract with the San Francisco 49ers, might be signed by a team after all. Kaepernick and the Baltimore Ravens spoke, and the Ravens management is “weighing” whether to sign the quarterback, according to the Baltimore Sun. Last year, he threw for 2,241 yards, 16 touchdowns and four interceptions. 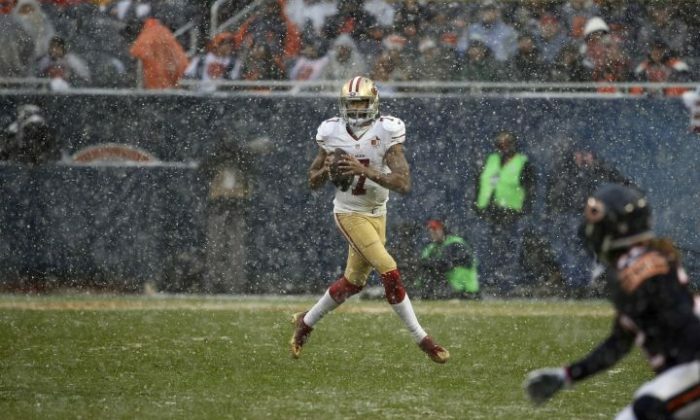 But in 2015, he fell off a cliff in terms of production, throwing for 1,615 yards, six touchdowns, and five interceptions while starting nine games and was benched for backup Blaine Gabbert. Ravens owner Steve Bisciotti spoke about the team potentially signing the quarterback, who made headlines last season for his refusal to stand during the U.S. national anthem. “We’re sensitive to it, we’re monitoring it, and we’re trying to figure out what’s the right tact. So pray for us,” he told reporter Jeff Zrebiec of the Sun. It comes as Ravens starter Joe Flacco was sidelined for a week due to a back injury. Kaepernick, meanwhile, maintained a relationship with Ravens coach John Harbaugh, the brother of ex-49ers coach Jim Harbaugh. There has been speculation that Kaepernick’s inability to find a roster spot on an NFL team is due to his anthem protesting and unpopularity. Other players around the league joined in. A new survey from JD Power, according to ESPN, found that national anthem protests were the top reason fans watched fewer games last season. Domestic violence also was a factor. “After that, 24 percent of those surveyed who said they watched fewer games said they did so either because of the league’s off-the-field image issues with domestic violence or with game delays, including penalties,” the report stated. The Ravens are also reportedly looking at signing former Redskins and Browns quarterback Robert Griffin III.